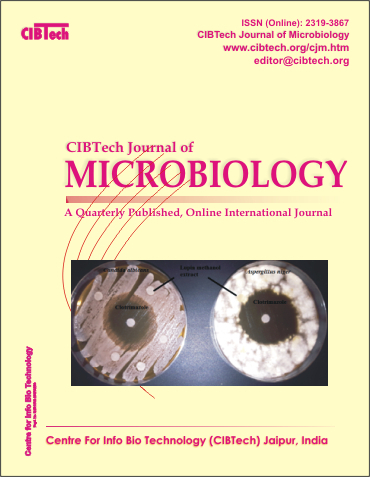 CIBTech Journal of Microbiology (CJM) is an open access online international journal that provides online publication of original research work, review, and views in all areas of Microbiology. The Journal (CJM) is being published by Centre for Info Bio Technology (CIBTech) (Regd. No. SH/311R/2-16AP/42/09) with an objective to promote speedy publication of research work fulfilling the general criteria of significance and scientific excellence. All the articles published in CJM are rigorously peer-reviewed. The Journal is published quarterly (four numbers per year) by the end of March, June, September and December. Aim and Scope of the Journal: The aim of the Journal is to provide a platform for the researchers and academicians throughout the world to speedily publish, share and discuss various new findings and developments in the areas of Microbiology. The journal covers basic and applied aspects from bacteriology, virology, fungi, unicellular algae and covers aspects such as medical microbiology, fermentation biology, food microbiology, industrial microbiology, microbial biotechnology, microbial genetics, mushroom culture and cultivation, pathology, physiology, biochemistry, taxonomy and so on. General article: Covering current trends in research in Microbial sciences but may be interesting to general readers outside the field. Case report: It includes case reports in any area of science in relation to microbial agents. Book reviews: On reference books published on specialized field of microbial sciences.